What if we could cure stress, anxiety and depression without drugs and without talk therapy ? Mental illness or spiritual illness: what should we call it? More about the toxins in everything – IS YOUR BATHROOM AS SAFE AS YOU THINK IT IS? 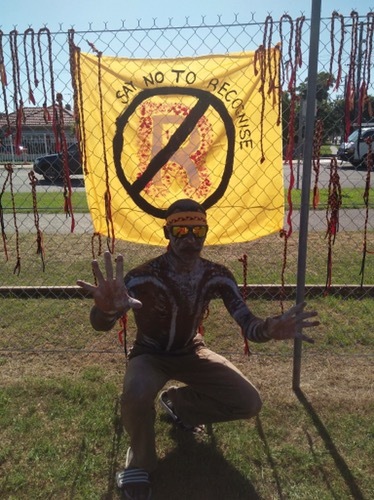 Aboriginal People lived in balance, Peace and Harmony …. Is it Survival/Invasion Day or Australia Day? 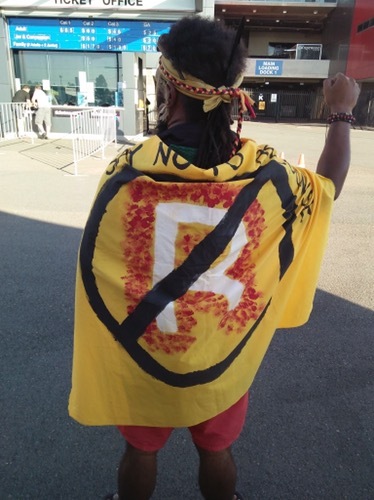 Fight Fire with Fire – time to really support the work of our Grassroots Vote No Campaign n support our Grassroots mob who work to get the message out. 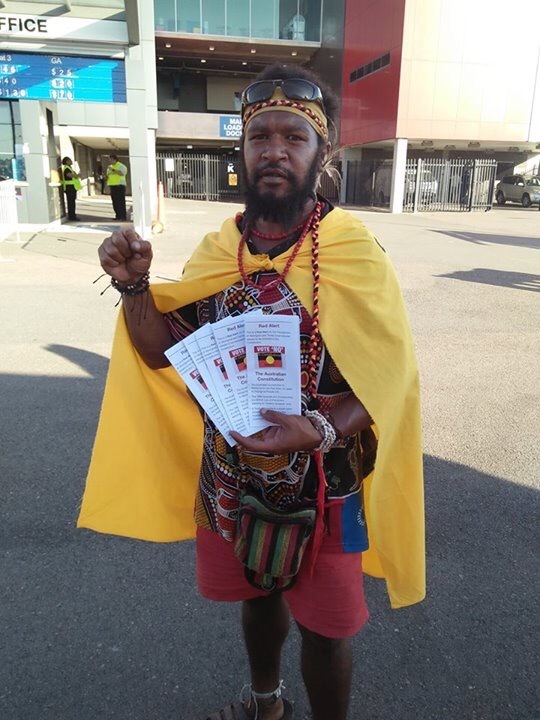 Like brother Whanjullah-imbala Palm Island-bwgcolman Buddah in Sydney we need to take our message to the streets. We have a petition, pamphlets, 10 reasons to vote no information sheets, a callout for videos from grassroots campaigners posted on vote no page warning mob of the dangers, upcoming online protest with changing profile pics and using hashtags, speaking up at national meetings that Recognise mob organise, fill in their online form, add your name to the declaration to oppose the Recognise scam and write to all blackfullas on the R team as a group of grassroots activist telling them how we feel and maybe include info sheet and pamphlet “10 reasons to vote no”. A GoFundMe has been suggested, maybe time for paid facebooks adverts and we definitely need a song which is also in the pipeline. Now all we need is our grassroots lobby team to drive this…. who’s in? Take it to the Streets- Just like Brother Whanjullah-imbala Palm Island-bwgcolman Buddah is doin here in the pics on the streets of Sydney. Maybe during a market in ur area or the busiest day of the week, set up with posters and info and just spread the message. Please help us make some noise using what we have and make this pic your profile pic. We need everyone if we are going to get the message out of the dangers of this multi million dollar Government campaig callled Recognise. 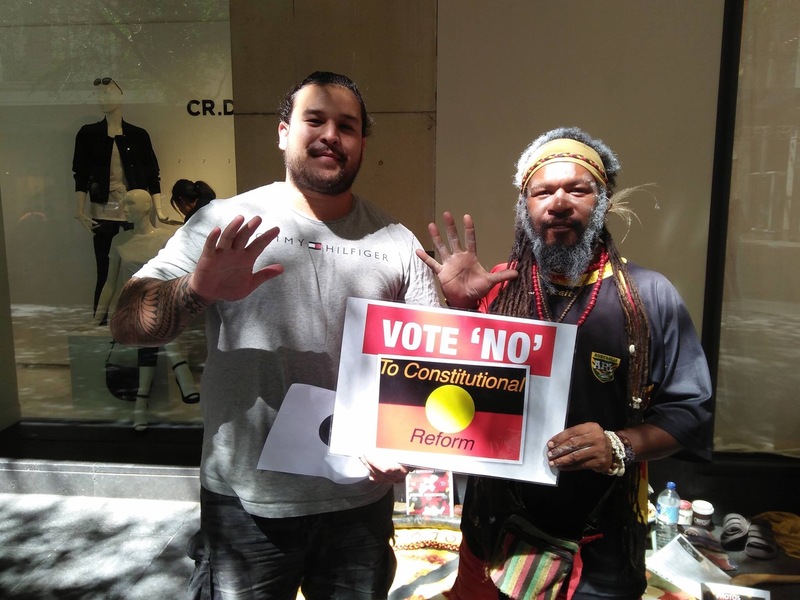 2017 Referendum for Constitutional Recognition – This is a clear message, the government has no jurisdiction and have no consent from the tribes. 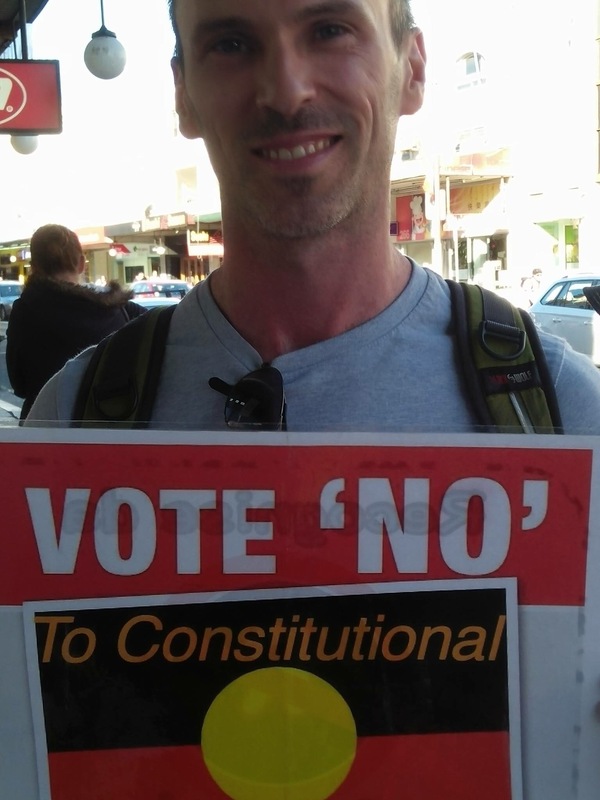 Please download Vote ‘NO’ To Constitutional Change pamphlet to print out and hand around. And please warn everybody about what the dangers of assimilation without rights are. 9. Everyone please click on this link and send these guys a message that we do not want to be recognised! https://referendumcouncil.org.au/join-the-conversation. Make Big Noise outside the meetings if they refuse to let you in to the meetings in your area. 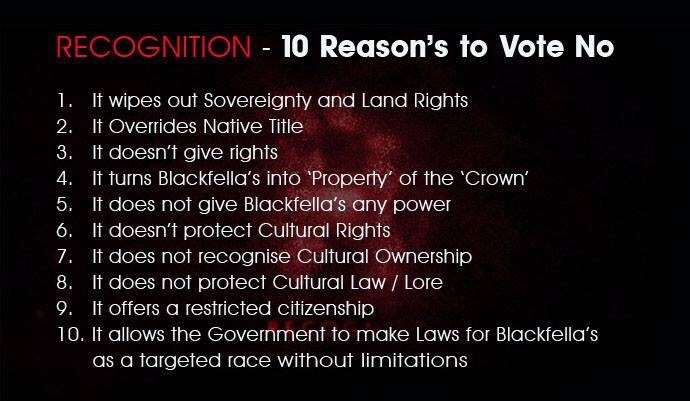 10: Write to the Referendum Council members and let them know we do not consent to them speaking on behalf of us and give the reasons why we are voting no to the Con. Co-Chaired by Ms Pat Anderson AO and Mr Mark Leibler AC. 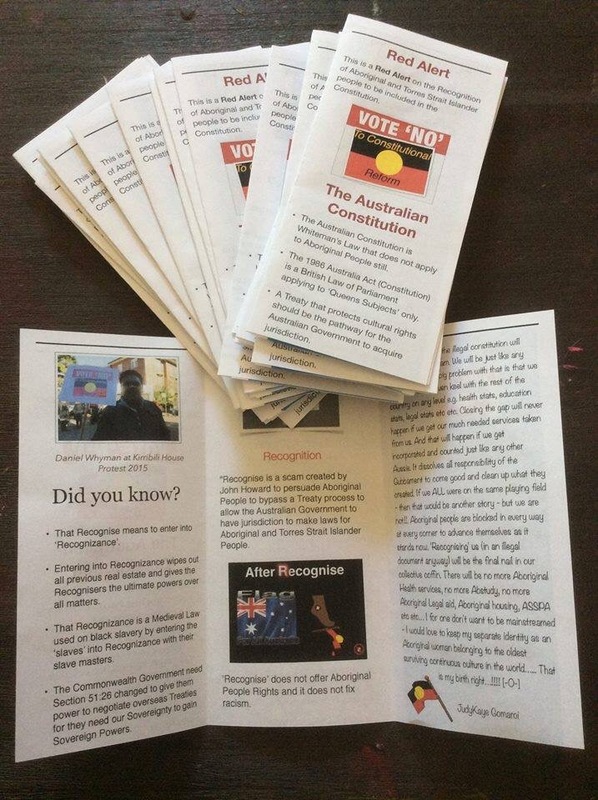 The other members of the Referendum Council are Professor Megan Davis, Mr Andrew Demetriou, Mr Murray Gleeson AC, Mr Mick Gooda, Mr Stan Grant, Ms Tanya Hosch, Professor Kristina Keneally, Ms Jane McAloon, Mr Michael Rose AM, Ms Natasha Stott Despoja AM, Mr Noel Pearson, Ms Amanda Vanstone, Ms Dalassa Yorkston and Dr Galarrwuy Yunupingu AM. The former Co-Chair, Professor Patrick Dodson, resigned as a Member of the Council on 2 March 2016.